This classic stationary loveseat features a clean, contemporary style that is sure to fit in any home. Rounded flared arms with welt cord trim, a comfortable seat and exposed wood feet add a modern look to the room that is both stylish and comfortable. Choose from leather, fabric, or Ultrasuede® and a variety of color options for a custom look that suits your needs. The Savoy Contemporary Stationary Loveseat by American Leather at AHFA in the area. Product availability may vary. Contact us for the most current availability on this product. 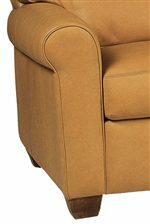 Fabric Options In addition to leather and Ultrasuede, all products are available in 450 color and texture options. Wood & Finish Wood legs available in acorn, espresso (black), or walnut finishes. Frame Construction All hardwood frames. Seat Support Optional eight-way hand-tie suspension. Padding & Ergonomics Premium high-density, high resiliency foam cushions and an advanced unidirectional suspension systems. Down cushions and extra firm foam are also offered. The Savoy collection is a great option if you are looking for Contemporary furniture in the area.